1948 built as DRAGON for Rederi A/B Drabant (L. Ringborg Mgr) (Swedish). 1960 renamed TULLAN. Owned by Partredereit For M.S. "Tullan" (Lars Johansson Mgrs). 1962 sold to Kaipara S.S. Co. Ltd. (she was their last vessel). Managed by Northern Steam Ship Company Limited. 1965 sold to Fletcher Industries Limited. Managed by Northern Steam Ship Company Limited. 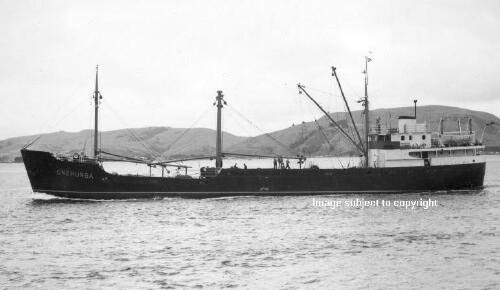 1968 June sold to Reef Shipping Company Ltd. of Fiji. 1968 October renamed JEAN PHILIPPE. 1973 sold to Keenan Shipping (Pte) Ltd., Singapore and renamed TROPIC WINDS. 1976 sold to Majulah Nav. Snd. Bhd. (Malaysian). Renamed TAT LEE. 1979 November 16th Lloyd's Class withdrawn at owners request.